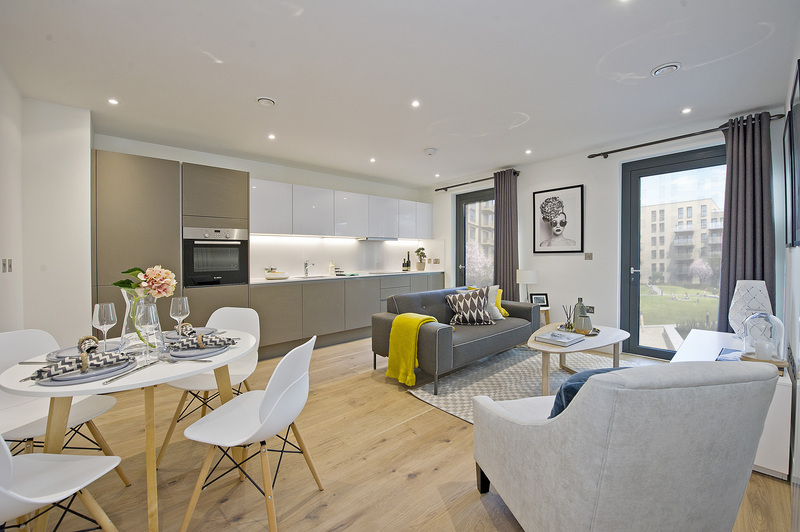 This new Wembley Park apartment building is just a 3 minute walk from both Wembley Stadium, and the London Designer Outlet, and 9 minutes from Marylebone. 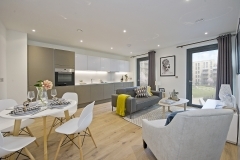 Located opposite Wembley SSE arena and around the corner from the tree-lined pedestrianised walkways of Wembley Park Blvd, these lovely high spec serviced apartments feature balconies with stunning views. There’s Wifi, Smart TV, parking, a washer/dryer, step-free lift access, a fantastic gym, in-house cinema and two club lounges. It’s a fantastic new London neighbourhood with iconic views, world class entertainment, and a plethora of popular shops, cafes, bars, restaurants, cinemas, and even a library! All apartments feature an open-plan kitchen/living area, a fully fitted kitchen, 40 mbps Wifi, a Smart TV with integrated DVD player, a washer/dryer and 4 sq m balcony. The kitchens have a full fridge freezer and a full size dishwasher. The living areas have a dining table with four chairs, an armchair, a sofa and a coffee table. The main bathrooms are spacious and feature a shower over bath, and a radiator. 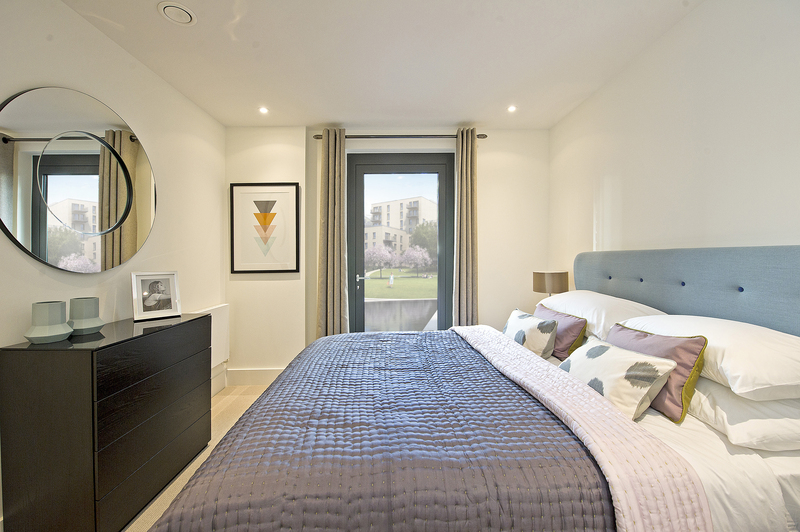 The master bedrooms have a double bed with twin bedside tables and reading lamps. Other features include: blackout curtains, separate privacy blinds, and two large internally lit wardrobes. All beds are king doubles (5 feet wide 6 feet 6 inches long, or 152 width 198 length) unless otherwise stated. -The 1 bedroom apartments are 50 square metres (538 square feet). -The 2 bedroom 2 bathroom apartments are 63- 68 square metres (678-732 square feet). The en-suite bathrooms have a shower cubicle with rain-fall shower head. The second bedrooms have one wardrobe and standard double beds, so 4 feet 6 inches wide, 6 feet 3 inches long, or 137 cm width 190 cm length. The apartment building is positioned between Wembley Arena (SSE) and Brent Civic Centre on the corner of Exhibition Way and Engineers Way, and is just a 3 minute walk from Wembley Stadium. This part of Wembley Park has been completely transformed into a quiet, smart and modern place to live with pedestrianised tree-lined walkways. Just around the corner is the impressive London Designer Outlet – a lifestyle and fashion centre with lots of restaurants, shops and a cinema complex. Just around the other corner on Olympic Way is Boxpark, a huge food & drink mall. 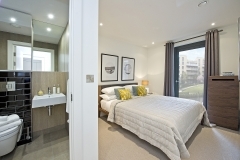 You get all the delights of a city centre in a compact, safe, pedestrianised zone, a short walk from your apartment, and all within view of the iconic Wembley Stadium. With both the stadium and Wembley Arena your access to live world class sport and music is unrivalled. Wembley is in the London borough of Brent and is 8.5 miles north-west of central London. 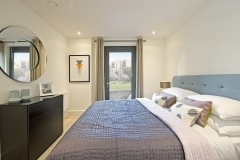 It’s a 5 minute drive to the A406 North Circular Road and a 7 minute drive to the M1 motorway. Wembley is convenient for Park Royal, Willesden, Stonebridge, Alperton, Sudbury, Kenton, Kingsbury, Northwick Park, Brent Park, Perivale, Northolt, Dollis Hill, Neasden, Greenford, Harlesden, Hanger Lane and Harrow. This 8 storey building opened in 2016. 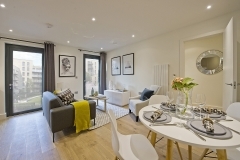 There’s 24 hour concierge for the development, a bike storage room, and an acre of communal landscaped gardens and a pond exclusively for residents. On-site secure underground parking is chargable and can only be accessed with a fob. The maximum vehicle height is 2.2 metres. There’s a very strict no smoking policy throughout, including balconies. There’s a fantastic in-house gym with a full range of cardio equipment, weights, machines, spinning bikes and a dance studio. This is operated by Total Fit UK and is free of charge for residents, but they must complete an induction with Total Fit before they’re free to use the gym. The induction is £30 and must be booked and paid for via the Total Fit UK app. Residents must be over 18 years old to enter and use the gym. Friends or visitors of residents may not enter or use the gym. The gym has a full range of cardio equipment, weights, machines, spinning bikes and a class studio. -The Nest has 100 Mbps Wifi, soft seating, a kitchenette, coffee machine and large communal dining table for eating with friends. It also has an outside terrace. -Deckhouse is the hub for fun and games, with a pool table, a kitchenette, and Sky Sports showing on a large HDTV. It also has an outside terrace.